I've always loved the ocean—I was born in Shanghai, which means "upon the sea.” And as a chef, I'm always drawn to food that claims a spirit of place. After moving to California, near Half Moon Bay, I began visiting the docks to buy seafood, and got to know the fishermen. Over time, it became evident to me that this part of our food supply is broken: many consumers purchase stale, unsustainably-raised fish from chain grocers. Meanwhile, fishermen often sell their diminishing catch to wholesalers at a very low profit, meaning their livelihoods are no longer sustained by their catch. There’s also the environmental factor to consider: Overfishing and illegal practices cause worldwide decline in ocean wildlife populations and wreak havoc on underwater habitats—not to mention the carbon footprint of transporting seafood far from its origin. Google’s chefs have long been committed to sourcing food for our cafes as locally, seasonally and organically as possible. And in our Mountain View headquarters, many employees cook with the same ingredients at home thanks to on-site Community Supported Agriculture (CSA) programs. When I joined the team as an executive chef in Mountain View, I wanted to make a difference in our purchasing program for seafood. For the five years leading up to then, I wrote a column for the San Francisco Chronicle called “Seafood by the Season,” and I knew it could be done. In early 2010, we began a push to apply the most rigorous standards to our seafood-buying practices, and respond to the in-the-moment fluctuations of the catch from small, independent fishermen. Things took off from there. My colleague Quentin Topping dreamed of providing the same high-quality seafood we serve in our cafes for Googlers to take home to their families. That idea became the Google Community Supported Fishery (CSF), which we launched in May 2011. In this program, Googlers sign up to purchase a weekly supply of local, sustainable seafood, supplied through a partnership with the Half Moon Bay (HMB) Fisherman’s Association. 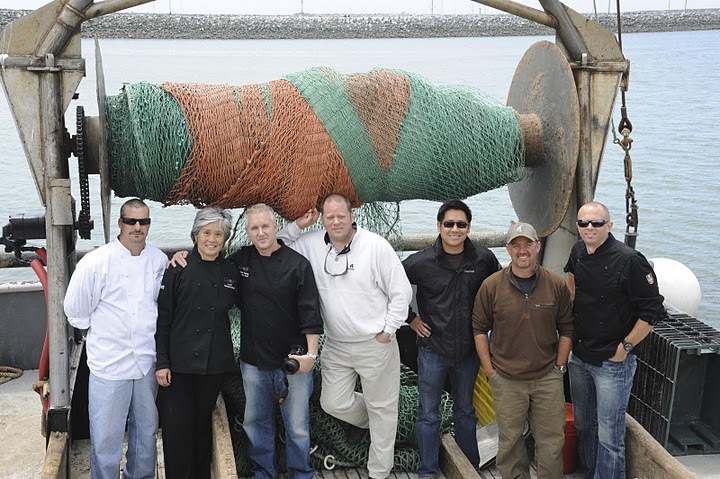 The Google Culinary team on a visit with fishermen in Half Moon Bay, Calif.—Quentin and I are the second and third from the left, in black. We tend to think on a massive scale at Google—whether it’s how to deliver instant search results around the globe or help thousands of small businesses get online—but when it comes to feeding our employees at work and at home, it really comes down to a local touch. Knowing where our seafood, meat and produce come from, as well as knowing how they’re raised, farmed or harvested, makes all the difference in the on-the-ground work of sustainability. We see many bright spots ahead for our Community Supported Agriculture and Fishery programs, such as expansion to other offices and adding a grass-fed beef and pasture-raised poultry program. It’s exciting to work someplace where we can think big and local. We know of two CSFs in the Bay Area. The Half Moon Bay Fishermen’s Association supplies only Google at the moment, but will soon add public drop-off sites—keep posted by visiting Farmigo.com. The other is CSea out of Bodega Bay. If you live elsewhere, we hope you’ll consider stepping up to create one in your area. And even if you don’t live near the ocean or have direct access to fresh-caught seafood, the choices you make about what fish to purchase or order in restaurants can make a real difference. You may want to consider following the guidelines that we used for our Google Green Seafood policy: Whenever possible, purchase species caught locally and in-season, by small, independent fisher-families, using environmentally-responsible methods. We think it’s important to be responsive to the fluctuations of catch too, and source from fisheries that enforce catch limits or are guided by ecosystem-based management programs. As for us, we’ll continue to research and source responsibly managed farmed seafood, and always keep transparency and Googler health at the center of our program.